SAN JOSE, Calif. – Apr. 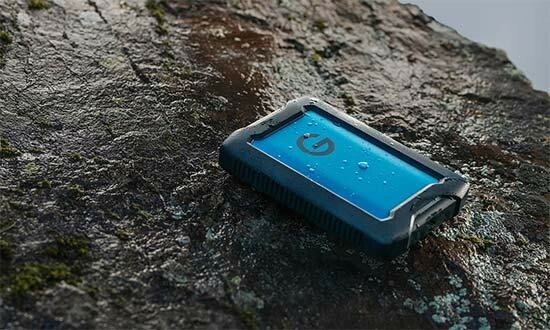 2, 2019 – Western Digital Corp. (NASDAQ: WDC) has expanded its line of rugged products to include the new G-Technology™-branded ArmorATD™ portable hard drive, an ideal drive for enthusiast and professional photographers and videographers seeking to protect their photo, video and audio files. Whether shooting on-location in the Moab desert, or working on edits during a morning subway commute, the ArmorATD drive is designed for content creators and audio/visual enthusiasts who want an all-terrain solution for moving and carrying their valuable media and data. With triple-layer shock protection, water/dust-resistance, and crush-resistance, they can be confident in their storage device during transit*.